Blog Home > AisleCop > How Can You Go Forklift-Free? Fewer forklifts make operations safer. How can you handle pallet loads without one? The forklift is ubiquitous in warehousing, manufacturing, distribution and other industrial operations, but many companies are actively working to reduce fleet size—or eliminate forklifts entirely. This seems to be mostly about safety. Powered industrial trucks ranked sixth for OSHA violations in the most recent data. They’re always near the top. They cause about 100 deaths in the United States every year, and tens of thousands of injuries, with a high percentage termed “serious”. Forklifts are often the single most hazardous machine in any facility that operates them. 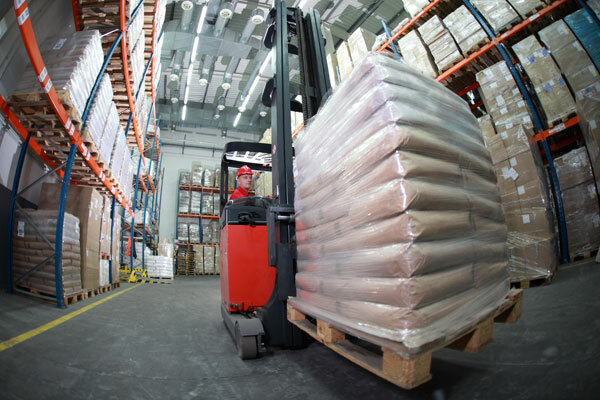 Can you truly make a warehouse forklift free, as many EHS experts recommend? Maybe not, but you can minimize forklifts and keep them out of the most dangerous areas. Let’s dive into some methods. What are the justifications for “forklift free”? The chief issue has tended to be safety, as described above. But there are other factors in play. Fallout from injuries: This might include lost productivity, lower worker morale, legal expenses, worker compensation costs and all the usual issues when it comes to forklift accidents. There are many costs related to a single forklift incident, and it’s good to understand all of them. See our white paper on justifying forklift safety for more information – PDF download. Reduced forklift operations costs: If you’re using a forklift infrequently, costs are incurred. That might include leasing or purchase costs, maintenance, and space. Reduced personnel costs: Forklift drivers require training and certification. If you can reduce the number of drivers required, it’s a direct cost savings for salaries, benefits, training and administration. Reduced material handling costs: If you’re using forklifts to do a job that can be done more effectively and safer with other means, safety increases while operating costs diminish. You can also save space if there are replenishment lanes designated for forklifts. You might not need certain handling equipment to deal with forklift loads. There are also scheduling considerations, scheduling burdens and other costs that reduce when forklifts are not present in a process. The forklift dilemma: how can you move and handle pallet loads without them? EHS consultants generally want you to remove forklifts from areas where people are present, but that’s often impossible. Exclusion zones—where either pedestrians or lift trucks are present, and the other not—are best practice for facility safety. Can you always do that? No. But where you can, you should. It’s slightly inconvenient, but orders of magnitude safer to create walking and driving lanes separated by hard barriers like guard rails. The goal shouldn’t be to eliminate forklifts if they have a legitimate role; it should be to minimize and contain them to where possible. Where you can’t do that, what are your options? The towable cart concept is probably the most versatile forklift-free method for transporting pallets through a facility. 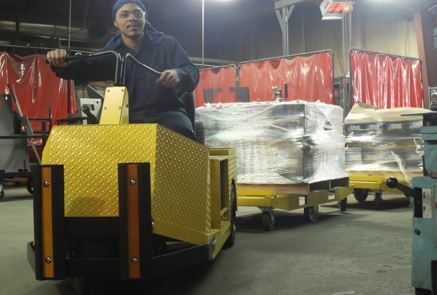 Carts are as fast and convenient as a forklift, but safer to operate. Importantly, a tugger or other transport vehicle can pull multiple carts—meaning it can bring a chain of pallets to any point, or multiple points. You can flow more pallets faster to more destinations this way in a single trip. Workstation interaction is where carts shine. Forklifts shouldn’t enter workstation areas where people are hard at work simply to deliver pallets when there are safer alternatives. Towing vehicles connect to a chain of carts to transport pallets to these areas. Tuggers are generally safer than forklifts because they are smaller and offer better visibility. They’re about the same size as a golf cart. They don’t back up. They can pass through traffic and even rack aisles safer and with more control than a forklift can. Since the pallet load is already on a cart, workers can move it around easier without resorting to pallet jacks or stackers. They can access the load, work on it and leave it for a tugger to pick up once it’s finished. In some cases, these loads are broken down and placed on takeaway conveyors. All of this actually contributes to ergonomics as the pallet can be pushed, rotated or moved without machine assistance in most cases. If the load is particularly heavy or bulky, utilize balancers or cranes to access it in the workstation. Some towable carts are also offered with tilt options. Some (very expensive) carts are built with integrated tilters or lifts. If your pallets require that, those can be worth the money, but be careful to analyze your options thoroughly before investing in those options. Carts are ideal for transport applications, but are unable to elevate or manipulate pallets once they arrive at their destination. 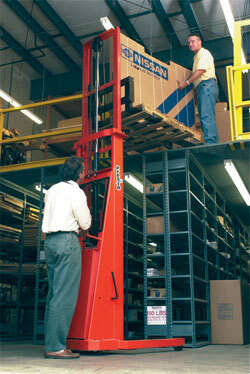 Stackers are great for a number of applications where forklifts could otherwise serve. Many companies use stackers in situations where a forklift would be underutilized, such as taking truck deliveries to a retail location where forklifts are otherwise unneeded. Used in conjunction with a method to transport pallets the the correct location, stackers can serve to place pallets on elevated platforms without a forklift in the area. The best stacker applications are in areas where employees are able to work on pallets, then elevate them to another work area or transport them off or onto a platform. They can be used in some operations where forklifts would be largely idle or cumbersome, like receiving pallets from delivery trucks without a loading dock. They’re very good for allowing work areas to elevate pallets without bringing a forklift in from elsewhere. Stackers are available in manual and power options. Some can be walked by an operator while propelled stackers allow for longer range product transport. The key is to understand how you want to use a stacker. Vertical conveyors (VRCs) are excellent for moving loads up/down from a work platform or mezzanine, but require fixed installation. They are far safer and more productive when it comes to moving vertical loads than forklifts. Methods such as conveyors and lifts are preferable to forklifts for elevated load movement for several reasons, but the chief one is safety. See moving loads vertically for more information on dealing with mezzanine loading/unloading options without using forklifts. 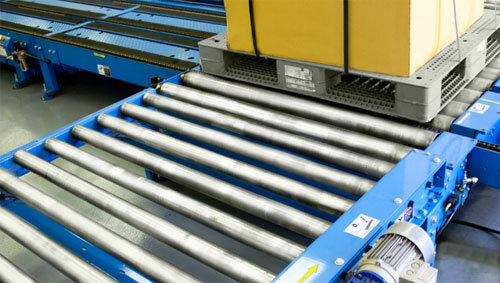 Pallet conveyors excel at letting your workers build or pick pallet loads as they pass through a facility. They’re often used as takeaway from a palletizer or build process, allowing basically touch-free transport for pallets after they are built. Conveyors are much safer than forklifts for straight transport. The important thing to remember is that conveyors are fixed location. If you have pallets (or other large loads) flowing through a facility from point A to point B (with or without stops between), conveyors are just more efficient than carts, pallet jacks or forklifts. If you’re processing loads for shipment, conveyors can deliver them to shipping dock areas where forklifts or other means can place them in trucks. This allows you to keep forklifts out of workcells in the plant, but working on the docks where they are easier to control. It minimizes them to loading/unloading roles, and keeps them out of transport functions. Conveying pallets for transport is most efficient for fixed point to point operations, but might not work best for low-volume and inconsistent operations. Pallet jacks move pallets safer than forklifts, but aren’t suitable for consistent transport. They’re also not workable for very heavy loads or areas where there is just too much volume. Use pallet jacks for tight areas, short distances, and in places where forklifts or other methods are simply not realistic. 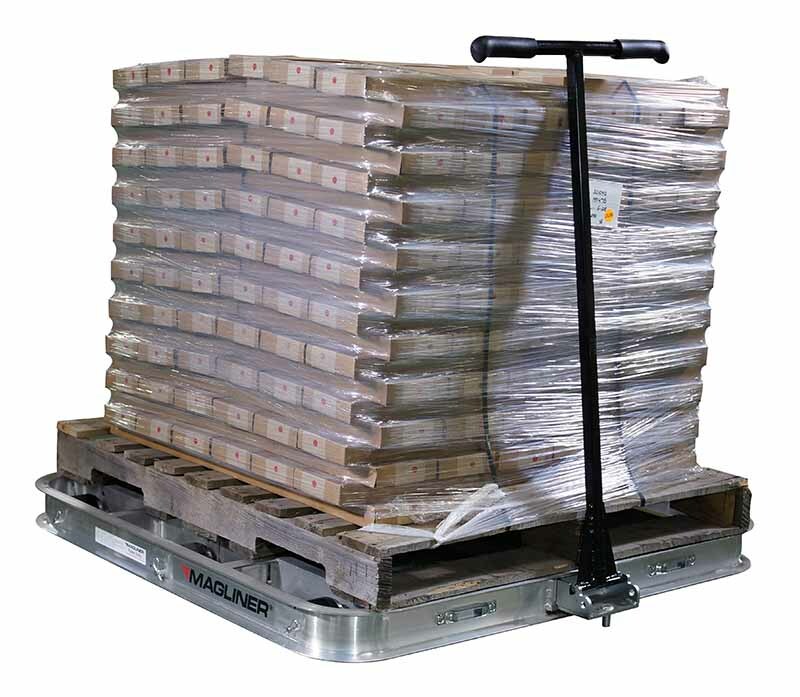 Pallet jacks tend to offer lower capacities, and can pose ergonomic challenges when used too consistently, even within their prescribed capacity ratings. Pallet dollies are great for short distance manual handling. These carts are good for very short range transport or manipulation, but shouldn’t be considered for consistent transport applications. They work best for allowing people in a work area to move big loads a short distance, rotate them, or otherwise deal with the pallet absent a forklift. If you have these situations, manual carts or “wheel pallet” are great for removing a forklift from the area. You will probably always have forklifts, but do you need them all? Where are people most common and how can forklifts be removed from that area? What functions are critical for forklifts. Where will you continue to use them? What are the costs of alternatives vs. ongoing forklift costs? Think of maintenance, training, and ongoing expenses in total. Can you deal with any loss of flexibility to remove forklifts from the equation? Are your loads specialized, very heavy or otherwise in need of handling solutions outside the norm? Forklifts are so common because they’re the default pallet/container transport method. They’re used in the applications where they aren’t the safest—or even most productive—method for pallet transport and manipulation. You should explore ways to use them for their primary, best functions while separating them from pedestrians and workcells whenever possible. Think of ways to eliminate them from roles they shouldn’t be playing in the first place and you are on the right track. You can work towards a “forklift-light” environment, work safer, and more productively.